Boreas Pass is a scenic road near Breckenridge, Colorado. 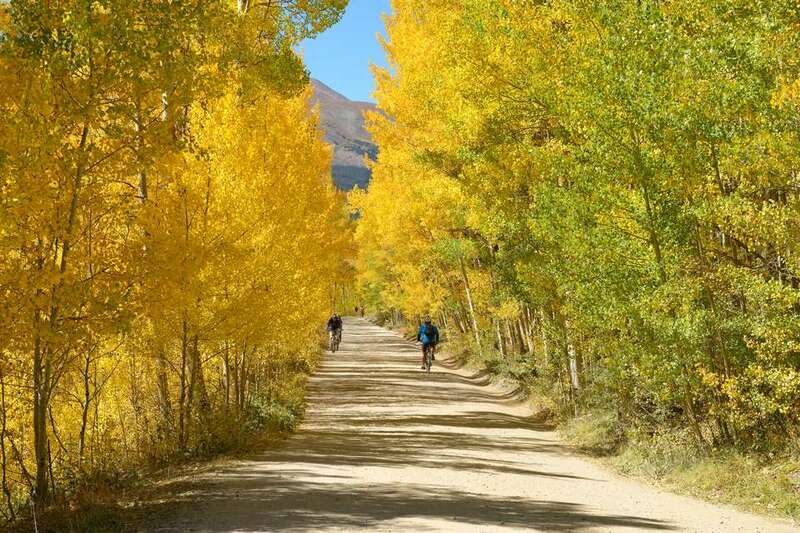 It used to be a railroad pass between Denver and the mining mountain town of Leadville (during the famous Colorado Gold Rush), but today it’s popular among travelers, people looking for beautiful views, mountain bikers and hikers. This is one of the best places in Colorado to see the stunning fall colors on a scenic drive, although Boreas Pass is beautiful in the summer, too. This road serves up sweeping views of the Tenmile mountains and Blue River Valley, and it will take you up to the Continental Divide. Boreas Pass is 22 miles long, just south of Breckenridge. In fact, it was originally called Breckenridge Pass in the 1860s when it first opened. Elevation: It's 11,481 feet above sea level, so make sure you’re acclimated to the altitude in Denver first and slowly work your way up over a few days. This high of elevation can lead to altitude sickness if you’re not cautious. Location: Boreas Pass is in the Rocky Mountains on the Continental Divide just outside Summit County. If you’re in Breckenridge, take Colorado 9 south and you’ll see the Boreas Pass Road on your left. This road can take you to Hoosier Pass, too. The pass connects Breckenridge to Como, Colorado. Road conditions: Some of the road is paved, but the higher you go, it is unpaved and can be covered in snow or mud in the colder months. This portion of the pass is closed to cars in the winter (usually by November 1) through mid- to late spring (sometimes as long as early June). It’s a pretty rough, gravel road, but in good weather (and if the road is dry), you can drive it in a regular car. When you get to the top, there is plenty of parking. Fun fact: When the road closes in winter, you can go cross-country skiing on it. All times of year, make sure you check road conditions before heading out because parts of the road may be closed due to weather or road work. The scenery of this mountain pass is stunning, and so is the history. Boreas Pass harks back to the 1800s, during the big gold boom. The pass was originally a trail, but miners needed a way to access the mountain towns, so it was eventually widened to accommodate stagecoaches. Finally, it was converted into a railroad in 1882 and used as a narrow-gauge railroad until 1938. In the ‘50s, the pass opened to cars and hiking trails, taking its current shape. Today, you can see historical remnants throughout. On the top, look for the historic Section House, boxcars at what used to be the train station and “Ken’s Cabin,” one of the oldest known buildings in the Breckenridge area. Head to Rocky Point for a restored patch of the railroad track. Ghost towns: If you like ghost towns, this is a great destination. On the north side of the pass, you can take a service road to the ghost town of Dyersville. The scenery: The views are big reason people visit the Boreas Pass. Look for Blue River Valley, the Tenmile Range and the trees as they evolve through the seasons. Outdoor museum: The pass features an outdoor museum that can teach you something, as well as provide great photo opps. Stop at the Sawmill Museum. Washington Mine: Just off Boreas Pass Road, head to Illinois Gulch Road and visit the Washington Mine. You can even tour this former gold mine on a guided experience with the Heritage Society. Mountain biking paths: Bikers love this area. The singletrack up here isn’t too tough, if you can handle the altitude. Some cyclists say it’s appropriate for bikers of all levels. Cross-country skiing: In the winter, you can go cross-country skiing in the peaceful snow up here, much different from the bustling ski resort of Breckenridge. Hiking trails: There are lots of trails in this area, including some that will bring you up the Continental Divide for breathtaking panoramas. Campsites: You can camp along the pass in a few different areas. Some require a short hike into the woods. Try the Selkirk Campground for a great, inexpensive place to rough it for the night.